This Spartacus the Movie Summary starts with a Roman salt mine in the province of Libya where Slaves guarded by Roman soldiers. The commentary makes it clear that the lives of the slaves are hopeless and that the only freedom they can look forward to is death. An aging slave falls and Spartacus (played by Kirk Douglas) goes to his aid. He is immediately whipped by a soldier and ordered back to work. 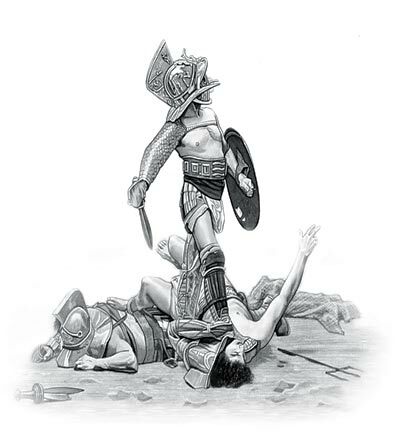 Spartacus grabs his ankle and bites, only a blow from another soldier stops him. He is sentenced to starve to death and is tied to stakes. The Slave Dealer and Lanista (Gladiator school owner), Lentulus Batiatus (Peter Ustinov) arrives at the mine searching for new slaves to be trained as gladiators at his gladiator school. The status of the slaves are illustrated by a shot of Batiatus examining a slaves teeth as if he were a horse. Batiatus sees Spartacus and enquires why he is tied to the rock. The Roman soldier laughs and says that there is nothing wrong with his teeth because he has just ham-stringed a guard. Batiatus promptly purchases Spartacus and teurns with his new purchases to his Gladiator Training School in Capua. (Capua was situated near Rome and was a great trading location where wealthy Romans went on shopping expeditions). The new slave recruits arrive at the Gladiator school owned by Lentulus Batiatus. He points out his new 'purchases' to his as chief trainer Marcellus (played by Charles McGraw). Spartacus is then branded with the other new recruits and his Gladiator Training begins. Spartacus makes friends with several other gladiators including Crixus (played by John Ireland). Spartacus also attempts to befriend an Ethiopian slave called Draba (played by Woody Strode). Draba refuses saying that gladiators do not make friends as they could be faced with killing each other in the arena. Gladiator training requires that the slaves are trained constantly to the highest fitness levels and with skills to enable them to fight well in the arena. Spartacus, having originated in Thrace, is trained a Thracian Gladiator. Gladiator training is a hard, highly disciplined life but there is some relief given to the gladiators. They are occasionally allowed to sleep with the women who work in the kitchens of the school. Batiatus instructs Marcellus to allocate a woman named Varinia (played by Jean Simmons) to be placed in the sleeping cell occupied by Spartacus. Varinia enters the cell and shrugs off her dress without saying a word. Spartacus gently touches her hair and her shoulders saying that he has never had a woman. The cell has an iron grating in the ceiling where Batiatus and Marcellus are watching and start to taunt Spartacus. Spartacus screams 'I am not an animal" and Varinia softly says "Neither am I". Varinia quickly dresses and is pulled out of the cell and is allocated to another slave. As time goes by Spartacus forms an almost silent relationship with Varinia by looks and by whispers of concern for her. The Gladiator Training School is in Capua. (Capua was situated near Rome and was a great trading location where wealthy Romans went on shopping expeditions). A powerful and wealthy Patrician called Marcus Licinius Crassus (Laurence Olivier) arrives at the school accompanied by his young friend Marcus Publius Glabrus (played by John Dall) and their two lady friends Helena Glabrus (played by Nina Foch) and Claudia Marius (played by Joanna Barnes). Crassus requests that Batiatus stages gladiatorial combat for their entertainment. Batiatus willingly agrees at first but then Crassus insists that the gladiators fight to the death. Batiatus at first refuses explaining gladiators did not die at the school, as it was bad for morale. However, he cannot resist the enormous fee that is offered. The giggling women choose the gladiators they wish to see fight in the arena requesting they be scantily clad - just for modesty. The Gladiators chosen are Spartacus, Crixus, Draba and another young gladiator. Crixus kills his opponent whilst Draba and Spartacus sit silently waiting for their turn to fight. Draba is the type of gladiator called a Retiarius (Net Fighter) who fights with a trident. They start their deadly combat watched by the Roman women and Crassus and Glabrus who barely bother to watch. The ambitious Crassus gives Glabrus the lucrative role as commander of the garrison of Rome. Varinia, waiting on the Romans also sees Spartacus in the arena, but catches the eye of Crassus who immediately decides to buy her. Spartacus loses the fight and Draba turns to the Romans for their instructions. They want Draba to kill Spartacus but instead he throws the trident at Crassus and leaps up to their box where Crassus cuts his throat. Spartacus escapes with his life due to the bravery and defiance of Draba. The Romans leave the school and the gladiators are sent to eat their meal. Marcellus then cruelly tells Spartacus that Varinia has been sold and she is seen sitting on a cart being sent to Rome. Spartacus can no longer control his rage, attacks Marcellus who he drowns in a vat of soup. The other gladiators also rebel and fight their way out of the gladiator school. Batiatus beats a hasty retreat and joins Varinia to flee to Rome. The gladiators lead a revolt against the Romans and take Capua. Other slaves join them as they fight and plunder their way across Italy. Spartacus is reunited with Varinia. The Slave army camps out on the slopes of Vesuvius. In Rome the senate meets and learn of the slave rebellion. The political enemy of Crassus called Gracchus (played by Charles Laughton) craftily challenges Glabrus, head of the garrison of Rome, to lead some of the soldiers against the slaves. This leaves Julius Caesar (played by John Gavin), friend and supporter of Gracchus, as temporary chief of the remaining garrison. Crassus is furious when he learns that he has effectively lost his power in Rome. But the senate have ordered Glabrus to lead the fight against the slaves and Crassus tells him that although he has been duped into this situation that he must go. Crassus warns him to leave Rome quietly without fanfare commenting that he hopes that Glabrus does not have to return as quietly. Crassus is then seen inspecting some new slaves. One of them is called Antoninus (played by Tony Curtis). Antoninus is well educated, a poet and a 'singer of songs'. Crassus attempts to seduce Antoninus but he runs away and joins the slave rebellion of Spartacus. The army of gladiators destroys the Roman army led by Glabrus. Glabrus skulks back to Rome in disgrace and is sentenced to death by the senate. More soldiers are sent against the slave army. Spartacus realises that they can never win and their only hope is to get out of the country. He and his commanders, who include Crixus and Antoninus, plan to bribe the Sicilian pirates with enough money to provide ships for the slave army to leave Italy. He puts his plan to Tigranes Levantus (played by Herbert Lom). Levantus is a Silician pirate and he agrees to help the slaves with his plan. The army of gladiators swells and slaves are taught how to fight by the gladiators. Spartacus and Varinia are happy to be free and their happiness increases when Varinia becomes pregnant. But their happiness is overshadowed by the continuous fighting - Spartacus doubts he will ever see his child, which he hopes might be a son. He cautions Varinia to tell the child what he was really like. The slave army reaches the coast just 20 miles away from where they are to meet the pirate ships. The success of the slave army starts to really worry the Romans. No one volunteers to lead the legions against Spartacus and Gracchus is forced to ask Crassus to take control and "restore order" to Rome. But Gracchus has another plan and tells Julius Caesar that he has backed the Sicilian pirates to help the slaves. If the slaves triumph this will mean defeat for his greater enemy Crassus. The plans backfire. Crassus enlists the help of the great Roman General Pompey and together the two massive Roman armies trap the army of gladiators. Tigranes then arrives at the camp of gladiators and reluctantly informs them that the promised ships have had to withdraw. With the sea behind them and the armies of Crassus and Pompey either side of them Spartacus realizes that he can only attack Rome and even more troops. Tigranes, feeling somewhat ashamed, makes an offer to transport Spartacus, Antoninus and the other commanders to freedom. His offer is refused and Spartacus and his commanders make preparations for the slave army to march against Rome. The armies of Rome meet the gladiators who they crush. The battlefield scenes are devastating. Varinia gives birth to the son of Spartacus at the end of the battle and is captured by Crassus. She tells Crassus that Spartacus is dead. Crassus does not believe her but and is deperate to capture Spartacus so he can take him to Rome alive. The thousands of slaves who survived the battle but have been captured are in chains ready to hear of their fate. Arrangements have already been made for the wily Lentulus Batiatus to act as the slave dealer. Spartacus the Movie Summary - "I am Spartacus"
Crassus then declares that the captured slaves will be given their lives if they identify the slave leader, Spartacus. Spartacus is just about to rise when he hears another voice proclaim "I am Spartacus" then another shouts "I am Spartacus" then another and then another until hundreds of voices are all shouting "I am Spartacus". A furious Crassus then proclaims that all captives will be subjected to the terrible death by crucifixion. 6000 slaves were to be crucified along the Appian Way, which was the main road which led to Rome. Crassus has Varinia and the son of Spartacus sent to his villa. He dresses her in the finest of clothes. Crassus believes that if he could get Varinia to love him he would have gained superiority of Spartacus. Varinia behaves like an empty shell, hiding all her feelings, but she makes it clear that she will always love Spartacus. Crassus wrecks his revenge on Gracchus who he banishes to the country. Lentulus Batiatus, bent on revenge, visits Gracchus. Gracchus gives Lentulus Batiatus 2 million cesterce to use as bribes to steal Varinia and her baby son from Crassus. Batiatus succeeds in his mission and takes Varinia and her son to Gracchus who gives them papers confirming they are free. He tells them all to leave Rome quickly. Gracchus then commits suicide rather than live his life as a pawn of Crassus. The long, painful journey along the Appian Way continues. Spartacus and Antoninus are forced to witness the crucifixion of the fellow comrades. They are the only two who remain. Crassus confronts Spartacus who spits in his face. Crassus is so incensed that he orders him to fight Antoninus to death - the winner to be crucified. Spartacus and Antoninus start to fight, each trying to save the other from the terrible death of crucifixion. Spartacus is the better fighter and just before dealing the reluctant death blow to his friend Antoninus tells him that he loved him as a father. Spartacus kills Antoninus dies and vows that "he will come back, and he will be millions." Crassus then orders the crucifixion of Spartacus - the horrible, agonising, lingering death that can last for days. Lentulus Batiatus, terrified that he and Varinai will be apprehended leave Rome via the Appian Way. Varinia sees Spartacus hanging from the cross. He is still alive. She takes her baby son and shows him to Spartacus telling him that his son is free. Distraught, and at the urgent pleas of Batiatus, she leaves her love to die, soon she hopes. She returns to the wagon and faces the journey, passing 6000 crucified slaves, down the road to freedom.